Chris Bartley (right) was a silver medallist at the London Olympics. 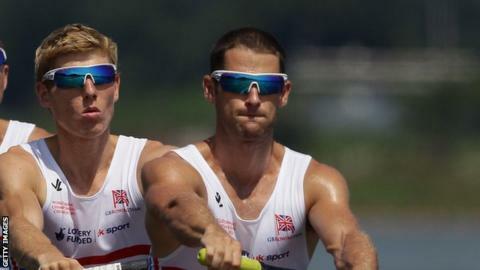 There were mixed fortunes for Welsh rowers in the European Championship in Germany. Chris Bartley was in the lightweight men's four who won a silver medal. "We're pretty pleased with this as a starting point," said 32-year-old Bartley from Wrexham. But it was a bad day for Victoria Thornley and her Scottish team-mate Katherine Grainger who were fourth in the women's double skulls. London Olympic champion Grainger and Thornley struggled to make an impact, with BBC commentator and two-time Olympic champion James Cracknell suggesting they should move into the women's eight crew for the Rio Olympics. Bartley says the four had targeted winning the race, but were beaten by strong-finishing Switzerland. "We thought we could have won it, we got out to a treally good start and it was almost on but we couldn't quite hold them off in the second half," he added. "But overall I think we're probably quite pleased."